Samsung has been known for one of the best manufacturers with its innovative and high-quality televisions. This source shows that Samsung took the largest TV market share in the U.S. in August 2018. There is a reason behind the biggest market share. That is Samsung does not make its consumers disappointed with its TV products. 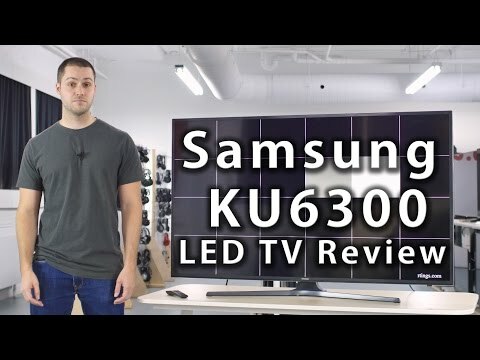 And, my review analysis told me that that is the case for Samsung un40ku6300. As a blogger, but also as a data scientist/engineer, I will use data analytics techniques to give you comprehensive and complete reviews in an easy-to-understand way. I believe in the power of collective opinions. I will say that they are more trustworthy than a single person’s view, although the person claims himself or herself as an expert. This blog post will harness the power of collective intelligence. Then, let’s first start with the rating. I have compiled over 3,000 reviews from Amazon and BestBuy. With the collected data, I calculated the average rating. As you can see below, the result was extremely high. This Samsung UHD TV, across those retail websites, gained a significantly high rating overall. Out of 5 stars, it gained 4.9 which is almost the full marks. This single factor might convince you to buy this product. In the next section, I will explain what types of sentiment the customer had toward this TV. Have you heard about a word cloud? This funny name is actually a good starter to learn how people describe things around us. With a word cloud, you can see specific words in different sizes. The larger it is, the more people used that word to describe it. For you, I will use this fun technique to help you to better understand this product. Can you see the big words at the center? Yes, they are actual words that the customers used to describe the product. As explained above, they are big because people more frequently used them. 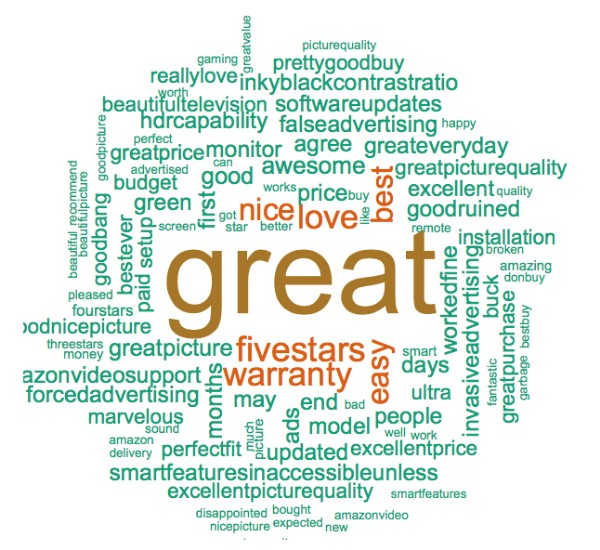 Words like “great”, “love”, “nice”, “fivestars”, “warranty”, “easy”, and more are very positive sentiments. By now, you would have more confidence on this product. These positive words explain how this product has received such a high rating from customers. As we just discovered the most frequent descriptive words, let me share what types of feeling the customer conveyed in their review. 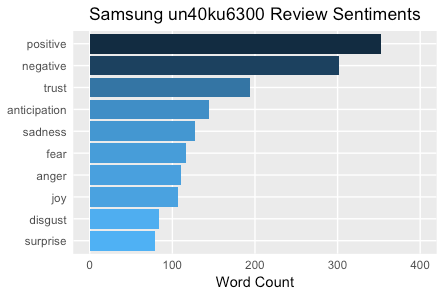 As a final analysis, I will show you what specific sentiments people had to un40ku6300. You will be able to see 10 different sentiments such as positive, negative, trust, anticipation, joy, sadness, fear, anger, surprise, and disgust. If you see the chart above, you can see that the positive sentiment takes the largest portion of all sentiments. It’s followed by the negative sentiment. Trust ranked 3rd, followed by anticipation, sadness, and fear. The “positive” and other positive sentiments together outrank the rest negative words. We have just looked at how people think about this product. Now, let’s find out what great features allured customers. 4K UHD provides a higher resolution than Full HD. With UHD, you can have a sharper viewing experience with your TV. This high resolution TV also has a slim design which looks smart and simple. UHD Dimming displays images with excellent contrast and clarity. PurColor displays colors that are closer to nature. With PurColor, you can experience life-like details. Upscaling Picture Engine improves lower resolution movies and TV shows to a near high-definition resolution with enhanced detail and optimized picture quality. Samsung un40ku6300 comes with Smart Hub where you can enjoy live TV, streaming contents, and apps. This product will feed you with an endless supply of fun contents. With Smart View, you can bring whatever you are looking on your mobile phone to the display. Screen Mirroring feature allows you to see on your phone on a bigger screen. As mentioned above, this TV boasts slim and smart design. To let you actually see it, I’ve embedded a YouTube video right below. This ku600 model comes in a variety of screen sizes including 40″ (or inches), 43″, 50″, 55″, 60″, 65″, and 70″. Consumers can have different experiences with different screen size. In my blog, I’ve also reviewed 60″ which has a different average rating and sentiment analysis result. Please use the link below if you also consider a different size. Samsung un40ku6300 UHD TV has received extremely positive reviews from its customers. My rating and sentiment analysis proved that this product is worth receiving a high rating and compliments from people. If you are looking for a UHD TV, this product can definitely be one of your candidates.